With Business Confidence Index (BCI) dropping by 8 per cent in July this year, the National Council of Applied Economic Research (NCAER) today forecast a reduced level of GDP growth of 7.9 per cent in 2006-07, as compared to 8.4 per cent in the previous fiscal. The government today proposed to revive over 30 sick public sector units (PSUs) through financial packages and merger of some units while assuring the release of salary of those employees by October, who have not got salary for the past over six months. 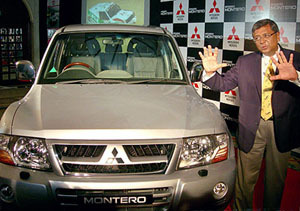 Hindustan Motors Managing Director Ravi Santhanam poses with a Mitsubishi Montero at its launch in New Delhi on Thursday. Videocon Industries Ltd. and four others have submitted final bids to buy South Korean home appliance and television maker Daewoo Electronics, a source close to the deal said today. Pakistan, which continues to ban Indian television channels, has permitted local private channels to air 6 per cent Indian content in their programmes during daily transmissions. The PHD Chamber of Commerce and Industry (PHDCCI) has opposed the move to amend the Right to Information Act (RIA) on the ground that it will curb transparency in the functioning of the government. Air Sahara today announced to start operations to 14 new destinations, including two international routes, by December as part of plans to have the largest network and a market share of 12-13 per cent by next year. As the government and the industry work towards an amicable solution to the drug price control proposed under the draft Pharmaceutical Policy, the pharmaceutical companies have agreed to voluntarily fix margins on unbranded generic drugs from October 2. Neyveli Lignite Corporation Ltd announced today that it would enter into a joint venture with the Gujarat Government to build an integrated lignite mine with eight million tonnes per annum capacity in Gujarat, at a cost of Rs 7,500 crore. The Haryana State Industrial and Infrastructure Development Corporation (HSIIDC) has decided to reintroduce the policy for compromise settlement of chronic non- performing assets (NPAs). The government today rejected the demand of private retailers, including Reliance Industries Ltd, for compensation equal to public sector oil firms to make up for the losses suffered on petrol and diesel sales. IT company Rolta India Ltd has signed an agreement with France’s leading international electronics and systems group, Thales, for establishing a joint venture in India. The rupee today ended sharply higher at 46.4350/4450 per dollar following fairly heavy exporter dollar sales amid a sliding dollar overseas and easing crude oil prices. All 759 branches of the State Bank of Patiala in the country are being re-engineered as centralised processing centres (CPCs). India's IT icon and Infosys Chief Mentor N.R. Narayana Murthy will join the Board of Trustees of TiE Inc (Global), a worldwide network of entrepreneurs and professionals dedicated to fostering entrepreneurship. ''Although several developments in the economy may have influenced the change in outlook, one important factor that may have been critical is the decline and volatility of stock prices in the capital market,'' NCAER said in its latest quarterly review of the Indian economy. While the GDP forecast after the first quarter pegs the lower growth this fiscal than last year, it represents improvement over the projections of 7.7 per cent in April, 2006. This improvement has come from industry and services, essentially capturing the effect of higher levels of FDI flows. However, the dip in BCI and reduced level of GDP rate of 7.9 per cent reflects a higher rate of inflation, relatively larger fiscal deficit of the Centre and a larger current account deficit. ''In the case of government spending, higher prices and interest rate implies more expenditure relative to revenue. The higher prices also imply lower export growth. Although import growth also declines, it is not sufficient to offset the impact of the decline in export growth on current account deficit,'' the reputed think tank said. The overall assessment for the current kharif season presented in the NCAER review is that the output may be only marginally better in the case of foodgrains output than last year. The high oil prices have put pressure on the government to support higher levels of subsidies on petroleum products, especially in the case of kerosene, liquefied petroleum gas (LPG) and high speed diesel (HSD). However, by not passing on the higher prices, the government is not promoting the conservation, substitution and investments necessary for more efficient utilisation of petroleum products. The industrial sector is witnessing a high rate of output growth for the third year in a row: the rate of growth of the Index of Industrial Production (IIP) for manufacturing was 9 per cent per year for the past two years. The first two months have again seen more than 10 per cent growth in the IIP for manufacturing over the same period last year. Thus, although volatility in capital markets affected implementation of new investment plans the output performance continued to be strong. Among industries, GDP from construction sector has grown by 12 per cent for the second year in succession in 2005-06. Supply of housing loans has spurred demand for housing construction and infrastructure projects. Urban infrastructure development has contributed to the strong growth of this sector. ''The rise in interest rates in the current year would have a negative impact on demand for new construction but this negative impact may be offset by income growth if the pace of the economic growth remains high due to other factors such as growth of manufacturing and services sectors,'' the review said. Despite the large outflows of foreign exchange under the merchandise trade account, strong inflows under the invisibles account kept the overall current account deficit within 2 percentage of GDP in 2005-06. “The concerned file is moving fast,” Heavy Industries Minister Santhosh Mohan Dev told the Lok Sabha during zero hour. He said the Board for Reconstruction of Public Sector Enterprises (BRPSE) has considered 41 cases of Central Public Sector Enterprises (CPSEs) and given its recommendations in case of 38 enterprises. The Board has recommended revival of 15 mills of National Textiles Corporation as well, besides 19 mills through joint ventures. The Hindustan Salts Ltd, HMT Ltd, Madras Fertilisers Ltd and Tyre Corporation of India have also been recommended for revival. However, the Board has recommended the closure of Bharat Ophthalmic Glass Ltd and non-operating units of Cement Corporation of India Ltd, the minister said. He said the merger of one sick unit with another was also an option of revival. For instance, he said, the government has approved merger of Indian Iron and Steel Company Ltd (IISCO) with the Steel Authority of India Ltd (SAIL) and merger of Praga Tools Ltd with Hindustan Machine Tools Ltd.
Daewoo Electronics is being sold by its domestic creditors, who own 97 per cent of the unlisted firm. The deal value is not known but earlier media reports suggested the sale could fetch up to $1 billion. The source, who asked not to be identified, declined to name the other bidders but added they were a domestic investor and four foreign firms, including Videocon. For Videocon, which makes televisions, picture tubes and home appliances, a deal would be its third major acquisition in less than two years. The local channels were allowed to air 6 per cent Indian content and 4 per cent English content, Minister in charge of the Cabinet Division, Major Zulfiqar Ali Gondal(retd), told the National Assembly yesterday. The permission was granted by Prime Minister Shaukat Aziz on “a reciprocal basis,” he said. The channels which have been allowed to telecast foreign content are GEO News, GEO Entertainment, ARY One, ARY Digital, Indus Plus, Indus Vision, Hum, DM Digital, Rung TV, Dhoom, TV One, Aaj, TV 2Day and N-Vibe, the minister said. The Pakistan Electronic Media Regulatory Authority (PEMRA) had allowed 10 per cent foreign content, including Indian programmes, on Pakistani TV channels in its 36th meeting that took place here on February 25. On behalf of PEMRA, the minister said necessary action would be initiated to include 20 per cent Pakistani content on multi-national channels. The PHD Chamber of Commerce and Industry (PHDCCI) has opposed the move to amend the Right to Information Act (RIA)on the ground that it will curb transparency in the functioning of the government. Ms Sushma Berlia, President of the chamber, said the decision to exclude side notes made in all areas except the social and development projects would only help shield the bureaucracy and there was no reason for politicians to go for such an amendment. The Indian bureaucracy had been responding well to the one-year-old RIA and the proposed changes was uncalled for, she said here today. She strongly felt that the public should have the right to view file notings as the government decisions were based on it. The public had the right to know where the money was being spent. Ms Berlia asserted that there could be no justification for excluding file notings from the purview of the Right to Information Act. It had been diluted to a large extent with file notings having been kept out. This censorship would render the act meaningless and would make the government functioning opaque, she said. Air Sahara President Alok Sharma told reporters here that the expansion of the airline would continue till December 16. “During this time, we will be introducing flights to Guanghou (China) and Maldives on the international sector and will connect Delhi with Port Blair," he said. He said the airlines would be operating a daily flight to Maldives through Colombo, besides connecting Dhaka and strengthening its metro network by increasing flights to Kolkata and Hyderabad. With this expansion plan, Air Sahara would be connecting Delhi to six international destinations. As far as domestic sector is concerned, the airline is planning to consolidate by flying more to mini metros like Chandigarh, Indore, Bhopal, Vadodra, Raipur and Nagpur and tourist destinations like Jodhpur, Khajuraho, Port Blair, Trivandrum and Udaipur. "We had a healthy discussion with the representatives of the pharmaceutical industry and they have agreed to voluntarily impose margins of 35 per cent for the retail and 15 for wholesale," Chemicals and Fertiliser Minister Ram Vilas Paswan told reporters here after a meeting with representatives of the industry. Earlier, there were no limits fixed on the margins for unbranded generic drugs and this move will help reduce the price of those drugs by as much as 60 per cent, he said. Mr Paswan said the government would be issuing a notification on the same as requested by the industry. The company will own between 74-89 per cent of the joint venture and the balance will be held by Gujarat Government or companies nominated by it. The project finance will be carried out with the debt:equity ratio of 70:30 and is scheduled to be implemented in five years. The capacity of the mine, to be linked to the 1000-MW project in South Gujarat, will be enhanced to 12 million tonnes per annum in the second phase. The Haryana State Industrial and Infrastructure Development Corporation (HSIIDC) has decided to reintroduce the policy for compromise settlement of chronic non- performing assets (NPAs). The Board of Directors of the corporation, which met here today, fixed the cut-off date to recover the NPAs as March 31, 2004, instead of March 31, 2002, so as to enlarge the scope for reducing the NPAs to the maximum extent. The new scheme will be valid till December 29, 2006. After the meeting, the Chairman of the corporation, Mr M.L. Tayal, said the corporation had registered an unprecedented increase of 63.79 per cent in its profit during 2005-06. He said the corporation had recorded a gross profit of Rs 29.43 crore against the earlier record of Rs 17.98 crore during the previous year. The Board decided to pay a dividend of Rs 2 crore to the state government which is an all-time high dividend paid by the corporation so far. The rupee ended 14 paise higher over the previous closing of Rs 46.5750/5850 as it also derived strength from firm Asian currencies, which remained strong against the dollar after the U.S. data on tame inflation and an increasingly uncertain housing market, forex dealers said. The global crude prices fell below 71.50 dollars a barrel in Asian trade during the day. All 759 branches of the State Bank of Patiala in the country are being re-engineered as centralised processing centres (CPCs). These CPCs will exclusively deal with either small and medium enterprises, personal banking, agricultural credit or disbursal of pensions and not as one performing all these duties. Mr Yogesh Aggarwal, Managing Director, SBoP, said that for better human resource management and to cut costs the management had decided to close down branches located in close proximity to each other. “We have 33 branches and two extension counters in Patiala itself out of which six will be closed. As part of this restructuring, we closed down 26 extension counters bank last year,” he said. As soon as the amendments to the State Bank of India Subsidiaries Act were cleared by Parliament, SBoP would be ready to raise money from the market. The bank planned to bring out an IPO later this year. The bank’s net paid- up capital was Rs 25 crore though the book value of the shares was Rs 3,000 crore. These shares could fetch up to Rs 15,000 crore in the market,” he said. The Managing Director said the overall business of the bank had grown to Rs 56,000 crore in the last fiscal, with the highest growth in advances (42 %) among private and public sector banks. The bank posted a profit of Rs 303 crore last year as compared to a profit of Rs 280 crore in 2004-05,” he said.